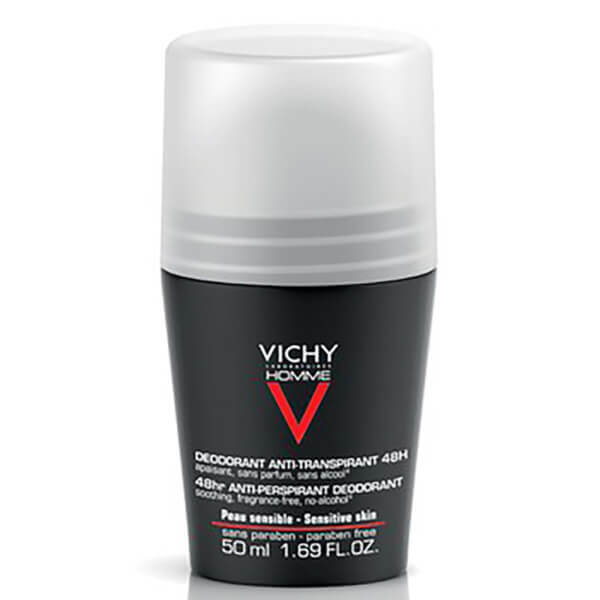 Take care of your skin with Vichy Homme Mens Deodorant Extreme-Control Anti-Perspirant Roll-On Sensitive Skin. The gentle formula uses a blend of anti-perspirant ingredients and Oligo-Zinc to help prevent perspiration and soothe discomfort for up to 72 hours. Offering a soft, fresh feel on application and no white marks left on skin. Hypoallergenic. Free from parabens, alcohol and perfume. Aqua / Water, Aluminum Chlorohydrate, Dimethicone, Aluminum Sesquichlorohydrate, C14-22 Alcohols, Steareth-100/PEG - 136/HDI Copolymer, Parfum / Fragrance, Perlite, C12-20 Alkyl Glucoside, Iodopropynyl Butylcarbamate.